The bottom line of any type of worthwhile “spirituality” is to connect us back with ourselves. Life happens and many times is not according to our “plans.” That creates a trauma which will need to be undone later on. That is a journey in itself. That is the beginning of all religious tales about salvation, redemption, heaven and the chosen ones… but at the same time, that is how we may start feeling that we are not the center of the Universe and that Life is fragile… on the surface. The above is not just an intellectual idea. It has been my experience. I have gone through the steps. I know. If you haven’t gone through that avenue of Life, you will certainly be naive in just believing what I have said. In Life, you must find out by yourself. That is the price of knowing. This knowing is not about reading Wikipedia, books and second-hand, “office world” learning. This type of knowing will give birth to a new consciousness. Consciousness changes through Life experiences. First and foremost, it is to BE sentient and our extent of identity with Life itself. All beings are conscious. That is what we have in common. That consciousness becomes individual through our physical/subtle form and then it will be shaped and conditioned individually through Life experiences. Greater consciousness means to be AWARE of the different levels of experiences. Most are bound by their own physicality. That is their consciousness. Nothing wrong with that. By hearing this, most may want to improve, most want to change to “become better.” What a great ego trip that is! Rather than acknowledging who we ARE and learn from that acceptance, we like to deny it to live according to an ideal. Elementary religious systems and moral standards are in that “black or white” consciousness. That is the collective consciousness. It does not mean that their consciousness is the “truth.” It only means that it is a particular range of experience. Life is like a movie. Consciousness like the audience of the movie. Some will like something in particular about the movie. Others will not. Observe that your liking or disliking binds you to a particular experience. That liking or disking defines you, it will give life to that “I,” that ego…. “I like this.” I want for Life to follow my likings. Nothing wrong with liking something, but be aware that because of that, something which is not of your liking will appear, for Life is greater than a definition of likings of the “I.” Life is a TOTALITY. A religion may preach to treat every event in Life equally without likes or dislikes. Followers will DO that, fake it… Their consciousness is not there to support those words. Then “practice” is preached but “practice” does not change consciousness, it only creates a behavioral habit. It is a mental fake. There is no movie without an audience. “We” are both. The sensible thing is to ENJOY the TOTALITY of the show and not to get caught up in a part. Because our society is living in the mind, we tend to hide our emotions as dust is hidden under a carpet. For instance, we may know that death will arrive sooner or later. If a son dies before the father, we may label that as “untimely” or “premature.” Our minds have an expected pattern. If the father dies before the son, even though the pattern has been respected, even though the son knows the father will die first; when the day comes for the father to depart, the son may break down emotionally. A religion may talk about the “future.” “Now” does not matter. The “future” is important. Many things could happen to a person “now” but forget about it. This behavior closes the capacity to feel. It is the perfect scenario to put up the “tough” face despite living with a melting heart. In the opposite side, a “self-help book” may acknowledge our emotional side. “It is OK to express how you feel,” nevertheless; the trauma created is unexplored. If a child is aware that his father has passed away, we could tell him: “God has called your daddy.” Frustration and anger may develop in that child for that idea of God, but our belief may be that we are helping him to deal with his pain. We are incapable of explaining that death is as natural as living and death can arrive to anyone at any time. Because “you” are here now, “you” will not be. Simple, rational. Give him a hug with empathy, allowing him to feel support. That is compassion when it is no rehearsed. As everything in Life, every experience will go away, and we will move on, we will evolve… unless we decide to keep that experience as a trauma. That is my recent discovery about Life: Be there emotionally, allow the inner child to express, but at the same time, be there rationally, allowing the inner parent to hold the child. Both archetypes are inside us. Thus, integration into the Totality is how the “I” is healed, for it means to see the Ocean rather than segmenting it and focusing only on a drop of it. In the discovery of our connection with the Totality, the meaning of “spirituality” changes completely. Spirituality is the art of living Life in joy. What happens when there is “no-I”? Is that the goal? There is no goal, nothing to “achieve”… “No-I” will bring “I” again. Just like day brings night and night, day. SO… What is the goal, the objective? There is none. It is a moving circle, a hand watch moving. Some may say the goal is to see time. Some may say the goal is to have a “nice watch,” a piece of jewelry to show. So… What I am supposed to DO in Life? Nothing, unless “you” want to DO something. Enjoy it! A religious person is someone who has built an ego. His belief, the religion he represents, his behavior are representations of an ideal. That defined ideal is significative for the presence of ego. It is the same scenario for a “mundane” employee of company “XYZ.” As long as there is identification with that company, there will be ego. There is nothing wrong with defending something we believe in, but the keyword to note is IDENTIFIED with that which we believe in. For instance, I could believe in Christian teachings, but if I am willing to fight and kill, to give my life for a belief, that is extreme identification, extreme ego. We may praise those as “saints,” but that is just extreme ego. “I am a Christian.” That is ego. A “spiritual” person cannot define himself with a belief, a religion, a tradition. Otherwise, his views are narrowed down to HIS beliefs. That is ego. Similarly, a seeker who wants to “find” God, is merely trying to fulfill his ego. Why would someone want to find God? To be saved? To go to paradise? To become “special”? To get favors from him? To be taught by him, so this seeker can teach others? That is exactly what ego needs to survive, to become bigger. A “true” seeker is not searching for “experiences” that he can talk about to others. A “true seeker” is only looking to find himself. That is the search that a seeker cannot talk about. That search will not make him “special” under anyone’s eyes. When a religion has a belief system which claims to be the “truth,” there will be another belief system with opposite beliefs which will claim to be the “truth” as well. Paradoxically, because they are opposite, both are truth. That is why, a partial belief system wanting to embrace only one side of the duality, is not really teaching the “truth” but is merely a method for the follower to find his own truth. How? When you identify yourself with one side of a duality, you will need to be aware of your rejection of the other side. That rejection creates ego. If you are not AWARE of that ego, you will not know what ego is. You will only have concepts, definitions; that is another way to distract your awareness. That is why, at the end of the road, religions, philosophies, and gurus do not matter as source of “truth,” but as methods for inner search. No. It will be a necessary experience for the ego to increase its size until is ready to blow up, to be torn apart through the experience of surrendering that ego. Why do you write so much about ego? Because happiness, love, compassion, surrendering, joy and gratitude are only pretty words used in some political/religious talk, without any meaning until ego is confronted. Most are lost in beliefs, worship, rituals and traditions hoping to get “heaven” or some other “golden star in their chart” when they die. They are not aware of their ego minds, they are not aware that unless the “I” disappears, there cannot be that “divinity” that they are searching for. In a nutshell, “God” is always there, but you cannot be in communion with Him, because “You” are there. When we are empty and not full of ourselves, we may discover it. A human being has a duality within. That is the male/female energy, which is manifested through a body. When we identify with the form, we call ourselves “male or female.” Nevertheless, our psyche has to agree with that denomination as well. If it doesn’t then we have the other shades of colors besides the “black and white,” male-female type of standard. When someone embraces the path of a seeker, sooner or later loneliness will be faced. That loneliness increases for the need of finding a complementary energy will be always there. It is part of Nature. Inside ourselves, there is the “inner kid” which most psychologists now agree “exists.” However, there is a “full-family” inside every individual. There is the male- female and kid energies. To balance those energies is of utmost importance to find that wholeness inside without neediness. Once that wholeness is found, then to integrate that oneness with “others” is the next step. “Loving yourself” is more than a “nice spiritual phrase.” It is to recognize our value, worthiness and respect for being. We could start with self caressing ourselves, pamper ourselves, to use this body to manifest that which we would like in a partner. Obviously the above may not be accepted for there is a strong taboo against touching our own bodies or allowing complementary, natural energies within to manifest. Unless we learn to balance our own energies, to live by yourself harmoniously may not be possible. Everyone will go by in our lives. We need to learn to live in balance with ourselves. By identifying ourselves with a particular “role model” or stereotype, we deny our own manifestation. The “black and white “ belief that a “man” has to be this way and not that way, or “this is the way a woman should act..” is nothing but a belief and as such it is worth only as long as someone gives value to it. Therefore, to integrate the “family” within is of great value to experience that oneness which is needed to embrace a greater oneness with all. We cannot pretend to be One when we are needy. We cannot pretend to live harmoniously in a relationship with another person, when we look for our needs to be satisfied by another. 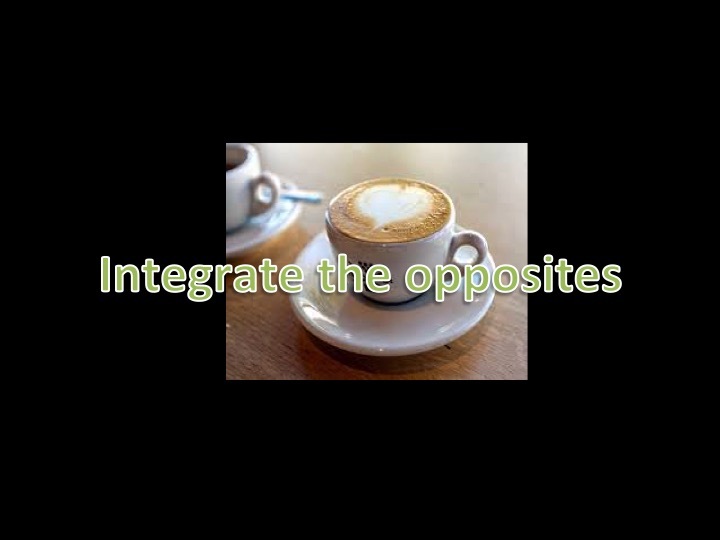 Coffee and milk get together to bring their own flavor into the mix to create something different with their own oneness. 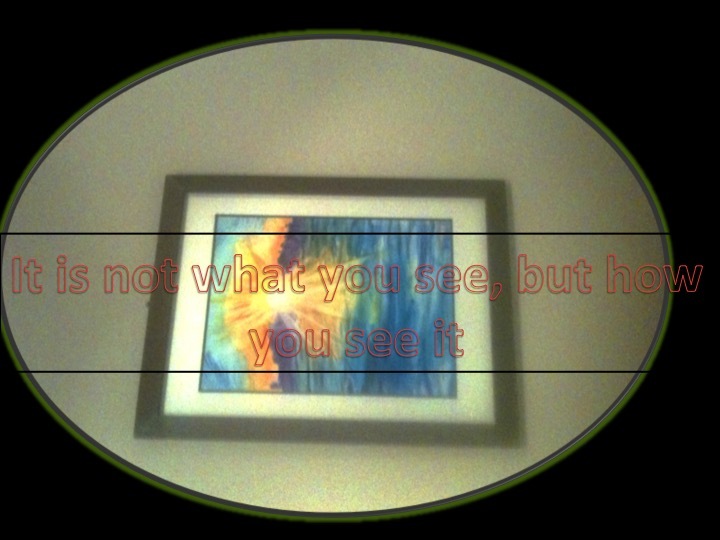 When we observe a picture on the wall, our perspective of that picture is dictated by our location. We have created so many “concepts” which we believe to be “real,” without perceiving the reality of our location of consciousness. When our consciousness is located in the existence of the self, the individual; then the concept of “free will” appears. Since that “self” is immersed in duality; then “predestination” will be born just like darkness is born out of light. Out of those 2 concepts, other concepts have emerged. “Free-will” brings the concept of responsibility. Do we see how a concept pulls another? Until our consciousness is able to perceive a different reality, we could be trapped in further concepts. Look at the picture from a different location. There we find oneness, totality. If we are One, if there is interbeingness, how could we come up with concepts such as “free will” and “predestination”? Who has “free will”? The individual, the “I” believing to be separated from everything else. In oneness concepts such as “brotherhood” are no longer needed; for we don’t need to pretend to be “brothers and sisters” to get along; but we realize that this “I” and that “you” as separation is non-existent. A clock has parts, which work together to make a clock. A part of the clock by itself is of no consequence unless it is related with others. That is oneness. Could we say that this clock has free will to move or that it is predestined to move? The clock is meant to move. That is all. Life is like that, One. When it is said that the “world is approaching a new consciousness,” what do we think about that? It is just the change from the perception of individuality into oneness. That is the other side of the paradoxical aspect of life; in that location of consciousness there is no rationality needed, no concepts such as “free will” or “predestination” but rather recognition of a path. It is a feeling, intuition which connects us with life, with the Totality rather than dualistic thinking. It is complete freedom from the known.